Each chapter covers the epidemiology and pathogenesis of the disease, as well as presentations likely to be encountered in both clinical practice and exams. 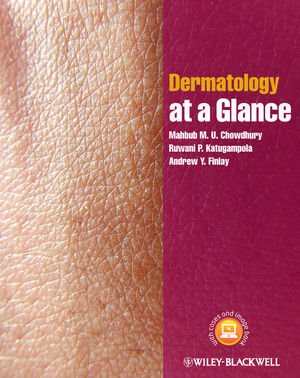 Includes a companion website at www.ataglanceseries.com/dermatology featuring self-assessment case studies, key point revision documents, and an image bank from the book. The descriptive diagrams and photographs, coupled with clear explanations, will help all medical students and health professionals get to grips with the identification and treatment of all of the most common skin diseases. Andrew Y. Finlay is Professor of Dermatology, Department of Dermatology and Wound Healing, Cardiff University School of Medicine. Andrew was awarded CBE in 2009. The authors have contributed significantly to the success of the joint registrar training days awarded the Cardiff University Postgraduate Deanery Innovation Award in 2012. The Cardiff Dermatology academic team won the Times Higher Education Award in 2006. Dermatology at a Glance Companion website features self-assessment case studies, key point revision documents, and an image bank from the book.